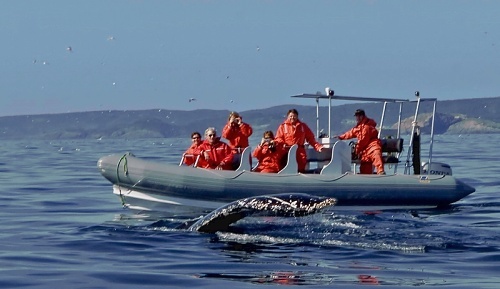 Aboard our Zodiac you will intimately experience the world-renowned Witless Bay Ecological Reserve. The reserve is home to the largest Puffin population on North America's east coast. You'll also see Murres, Razor Bills, Thick Bills, Storm Petrels, Guillemots, Northern Fulmars, Kittiwakes and Herring gulls soaring and diving the waters of the reserve. 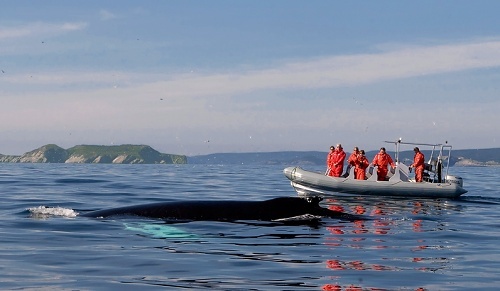 During the summer months Fin, Minke and Humpback whales can be observed closely as they feed on spawning schools of capelin. The sight of a breaching whale in its natural habitat is breathtaking. The majestic humpback can be over 70 feet long. You may even see an iceberg during the tour early in our touring season during the months of May and June. We design our tours to allow plenty of time to explore the bays, beaches and coves so that you can relax, photograph and observe. 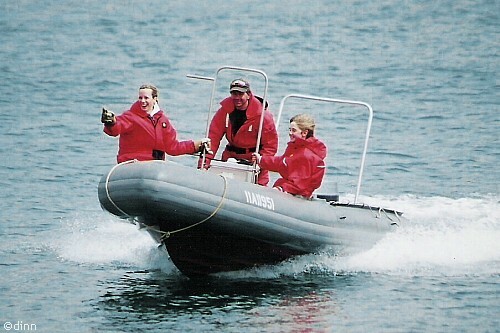 We have two zodiacs that will easily accomodate groups from one to sixteen people. The tours last approximately 2 hours and our rates are competitive, just $85.00 per person.